Efforts will be made to reduce any effect fewer Cruise Ships entering Dublin Port from 2021 will have on Dublin, it's retailers and ancillary businesses. Ministers Ross and Griffin requested all parties to work together in the coming weeks under the auspices of the Cruise Ireland organisation. The cruise industry is worth €50 million to Irish tourism, but an announcement by Dublin Port last month that it is to reduce the number of passenger ships has been met with concern. 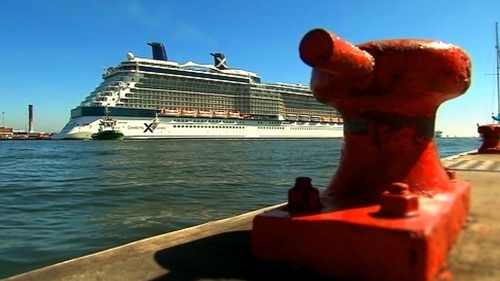 Last year, 150 cruise ships called to Dublin port. This year that number will rise to over 160 but from 2021, only 80 ships will get access to berths. The Dublin Port Company says cargo volumes are up by over a third since 2012, leading to tighter berthing space, and the reduction in Cruise liners is necessary for capital works to allow year-around cargo services and seasonal cruise ships. Earlier, a group of businesses campaigning against the Dublin Port Company's decision reacted angrily to its exclusion from today's meeting. Representatives of the All-Ireland Cruise Ship Action Group say they were denied access to the meeting despite "lengthy correspondence and numerous requests" to the Ministers office and Tourism Ireland. A spokesperson for Mr Ross says he is happy to meet with the AICSAG this week. The Cruise Ship Action Group has criticised Mr Ross, the Port and tourism agencies for not communicating adequately with international Cruise Line Companies on the matter. The group says a number of the companies have stated that a cruise of the UK and Ireland without Dublin will not sell and that they will move to other regions around the world. Last week, Dublin Port was not represented at what is viewed as the biggest cruise networking and promotion event in the world, the annual Sea Trade Cruise Global exhibition in Miami. It was the first time representatives did not attend, according to AICSAG’s Niamh McCarthy, who has attended the exhibition since she established Excursions Ireland in the late 1990s. Cruise Line Companies, according to Ms McCarthy, were "dismayed" that representatives of Dublin Port were not at the event to answer questions. She said they were equally dismayed that the minister or a top Executive from a National Tourism Agency had not contacted them directly. The Department of Transport says it is seeking all views on how to best minimise any disruption to the tourism industry through a series of meetings. The minister's spokesperson added that the Dublin Port Company's capital investments in the Port's redevelopment over the coming years could not be undertaken without disruption.